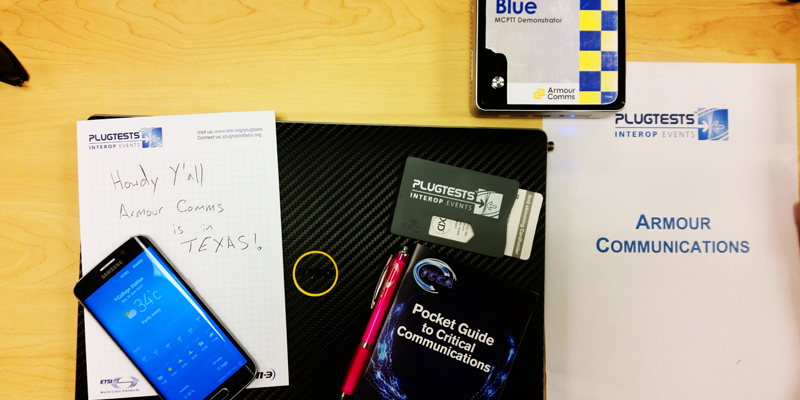 London, 18 July 2018: Armour Communications, a leading provider of specialist, secure communications solutions, has successfully participated in a week of plugtesting organised by the European Telecommunications Standards Institute (ETSI) and The Critical Communications Association (TCCA) in Texas. The capabilities of Mission Critical voice, video and data were put to the test during a week-long event of intensive testing of more than 300 combinations of vendors and equipment. The second ETSI MCPTT Plugtests attracted a total of 31 vendors with 120 participants on site, plus support from remote labs. Observers from nine organizations based in the UK, France and the USA witnessed the execution of more than 2000 tests, based on a test plan with more than 100 test cases, with a 92 per cent success rate. Armour Comms participated in testing for the 3GPP Release 14 Mission-Critical Push-To-Talk (MCPTT) protocols, which are fully integrated into the Armour Blue solution and supports different use cases including emergency and blue light, police and law enforcement, covert ops, and others. Providing the same great user experience as Armour Mobile, Armour Blue enables operatives in the field to collaborate securely with each other and to communicate with colleagues back at base via the Armour Blue Dashboard. Calls can be managed centrally to determine priority, enabling a more streamlined approach when handling emergency situations. The solution delivers a comprehensive range of communications features which include secure voice and video calls, one-to-one and group messaging, voice and video conference calls, file attachments and sent/received/read message status. When switched to Armour Blue mode, users have a direct channel, always-on audio radio, where they do not need to dial a number to speak to others in the group. Armour Blue is available for commercial off the shelf (COTS) devices which means there is no requirement for a ‘special’ phone, making deployment easier and more cost effective, and providing a greater level of anonymity for those in the field. Using a FIPS 140-2 validated crypto core, Armour Mobile has been awarded many other certifications including Commercial Product Assurance (CPA) from the National Cyber Security Centre (NCSC) and is included in the NATO Information Assurance catalogue.